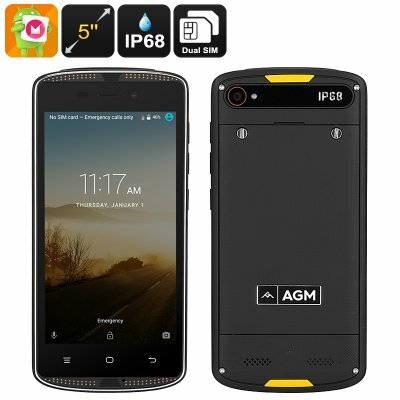 Successfully Added AGM X1 Mini Android Phone - Quad-Core CPU, 2GB RAM, IP68 Rugged, 5 Inch Display, Dual-IMEI, 4G, 4000mAh, Google Play to your Shopping Cart. The AGM X1 Mini Android Phone features an extremely durable yet stylish IP68 design. This Android phone does not only look good, it also is remarkably tough and resistant to water, dust, and drops. Thanks to this, your Android phone is guaranteed to operate perfectly no matter the environment. Whether you’re in the office, a dusty factory, or outside in the wild – this Android smartphone will always keep you connected. Thanks to its tough waterproof and rugged design, you’ll no longer have to worry about accidentally breaking your device. No matter where you’re headed next, this rugged smartphone follows you anywhere you go. Oh a crisp 5-Inch HD display, the AGM X1 Mini Rugged phone treats you to beautiful 720p visuals. Thanks to this, you’ll be able to enjoy movies and games no matter where you’re at. The phone itself packs a Quad-Core processor and 2GB RAM. This hardware provides you with enough power to tackle all the basic software features out there. Simply head out to the Play Store and download your favorite media. With 16GB internal memory and a 32GB SD card slot, this Android phone offers plenty of storage for you to fill up with games, films, pictures, and more. With its Dual-IMEI numbers and 4G support, this rugged smartphone keeps you connected at all times. It furthermore packs a powerful 4000mAh battery that treats you to up to 5 hours continuous usage time. Whether you wish to engage in online calls or browse the web, with this 4G smartphone you’ll always be within reach to friends and family. It even comes with a crisp 8MP camera that lets you shoot nice pictures and video of all your upcoming adventures. The AGM X1 Mini Android Phone comes with a 12 months warranty, brought to you by the leader in electronic devices as well as wholesale smartphones..